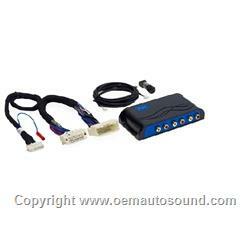 Amplifier Integration Interface: The PAC AmpPRO AP4-CH31 simplifies the installation of aftermarket amplifiers in select Chrysler and Dodge vehicles with data-bus controlled factory sound systems. With the AmpPRO AP4-CH31, you can improve your vehicle's audio performance while keeping an original radio's fit, finish, and features. The factory radio and factory amplifier must remain connected in the vehicle and be operational in order to use the PAC AmpPRO interface. If you are only using the PAC AmpPRO interface to add a subwoofer amplifier, the factory amplifier will still power the other speakers in the vehicle. 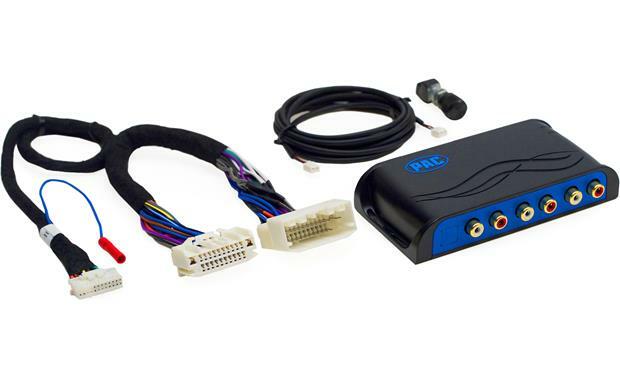 Vehicle Compatibility: The PAC AmpPRO AP4-CH31 amplifier integration interface is compatible with the following 2011-2015 Chrysler & Dodge vehicles with a data-bus controlled factory premium sound system. Note: This interface is only compatible in vehicles equipped with a data-bus controlled premium sound system. To verify compatibility, look for an Alpine, Beats, or Harman Kardon badge on the door speakers, center speaker, or factory subwoofer. If none of these brands are shown, check for the presence of a center speaker or subwoofer. 6Ch Pre-Outs: The PAC AmpPRO AP4-CH31 provides a 6-channel pre-amp output for use with aftermarket amplifiers. Using the full-range, fixed level factory radio output, in conjunction with data-bus CAN messages, the AP4-CH31 delivers a variable 5V RMS pre-amp output with fading, balance, equalization, and level control capabilities. Non-Fading Level Control Knob: Channels 5-6 (Sub) of the AP4-CH31 are non-fading outputs. The output level of channels 5-6 can be controlled using the supplied level control knob. The level control knob comes with a 6' cable which plugs into the interface module and should be mounted in an accessible location. Data Controlled Remote Turn-On: A data controlled remote amplifier turn on wire is also provided by the PAC AmpPRO AP4-CH31. The remote turn-on is rated at 2A of current. If more current is needed an external relay must be used. Retained Factory Audio Features: The PAC AmpPRO AP4-CH31 also retains all audio from other vehicle features such as factory Navigation Prompts, Bluetooth, uConnect, and Parking Sensor Chimes. Minimum Volume: If the minimum volume of your factory radio is too loud once the AP4-CH31 is installed, you can manually set the level of the minimum volume using either the programming button on the side of the interface or the factory SWC (Steering Wheel Controls) in conjunction with the supplied level control knob. You can also use AmpPRO PC app. AmpPRO PC App: Using the AmpPRO PC App (for Windows PC only) allows you to configure user interface options such as Minimum Volume Level and a 3-Band EQ from your Windows computer or laptop. The app can also be used to update product firmware. Minimum Volume Level: From the app you can set the minimum volume level of the factory radio. 3-Band EQ: Enables the 3-band EQ (Bass-Mid-Treble) with frequency and Q-factory adjustment. The Bass Frequency can be set to 60, 80, 100, or 120Hz; while the Bass Q-Factor can be set to 0.5, 1.0, 1.5, or 2.0. The Mid Frequency can be set to 500, 1k, 1.5k, or 2.5k; while the Mid Q-Factor can be set to 0.75, 1.0, 1.25, or 1.5. The Treble Frequency can be set to 7.5k, 10k, 12.5k, or 15k; while the Treble Q-Factory can be set to 0.75 or 1.25. Firmware: The AmpPRO app will also allow you to update the interface with new firmware as it becomes available. Note: These AmpPRO PC App settings can be adjusted with the module installed in the vehicle or on the bench. However, it is recommended to make the adjustments with the module installed, and the factory radio on so that the changes can be heard. Dip Switches: Set dip switch 2 to "ON" to lower the RCA output voltage to 4V. Set the dip switch 2 "OFF" to keep the RCA output voltage at 5V. Set dip switch 1 to "ON" to send all rear parking sensor chimes through the front channel. This should be used when the vehicle is equipped with rear parking sensors and you are either using the toslink output adapter (sold separately), or running all cabin speakers off of the front outputs of the AP4-CH31. Dip switches 3-4 are not used. Optional Toslink Add-On Module: When used in conjunction with PAC's APA-TOS1 (APATOS1; sold separately), the AP4-CH31 can provide a variable 2-channel fiber optic digital audio output (toslink). Toslink fiber-optical cable also sold separately. Optional Amplifier Harness: The APH-CH01 installation harness (541APHCH01, sold separately) simplifies speaker wire connections when using one the PAC AmpPRO AP4-CH31 to add an aftermarket amplifier or amplifiers in select vehicles that feature factory amplified sound systems. The APH-CH01 keeps you from having to cut or modify your vehicle's original factory wiring, providing "plug-n-play" connection at the vehicle's original factory amplifier location (you will need to make hardwire connections at the aftermarket amplifier/s).